Help my dog is disturbing the peace. As soon as I open the back door, my dog runs outside and starts to bark until we bring him back in. One of my neighbors called the police once on me already. But what can I do, my dog does have to go outside once in awhile. "The SOUND OF SILENCE is a beautiful thing", says Gregg Henson Radio Host for 97.1 FM. His three dogs were barking like a Russian AK47 in downtown Baghdad. Now he thoroughly enjoy this silence in his house, aft4er training with Alternative Canine Training. Barking is just symptoms to a deep rooted problem. You can always put a bark collar on a lonely, bored dog that is locked up in a kennel behind the garage. The dog may now be quite, however; the dog will still be lonely and bored. It means your dog thinks he is a police officer on duty. That means that he is the alpha dog and you have problem of leadership in the household. Separation anxiety, high pitch frustrated type of the barking. You need to Call Alternative Canine Training to get the protocol on how to correct this behavior. Dogs do not need to bark to communicate, relieve frustration, or to be happy. Barking dogs are actually expressing the exact opposite emotion. To understand you need to look at why dogs bark. If you have ever walked through a typical neighborhood that has fences as you walk past a house with multiples dogs, the dogs suddenly start fighting. Why? Because, only the top dog in a pack does the barking or the protecting. So the top dog might consider you to be a threat to their territory, but the dog barking next to them is a threat to their social position. This is far more important than you and so they put the other dog in its place, than they worry about you and the territory. This is why if a dog knows and understands that you are top dog, they will gladly give you the job of barking at intruders. We see this time and time again that once we make it no longer the dog's business to bark at everything, along with implementing out special program. The dog becomes calm, relaxed and cooled out. Their eyes are no longer darting nervously around looking at who and what they should bark at and worry about. Another words they are no longer frustrated. Yes some breeds are genetically more prone to bark. Shelties are one breed that tends to be notorious barkers. Beagles and many of your hounds were bred to bark, this allowed a hunter to follow the dog to the game. Terriers tend to be a little territorial and bark to tell everyone, that wherever they are, they own it. Silence can be achieved with these breeds it will just take a little more work. Often time's owners express the desire to have their dogs bark. It makes them feel more secure they want their dogs to protect the house. The problem arises when they can't get the dog to be quite or the dog starts to carry this protectiveness one step further. Yes, someday this dog might bite. You can't have your cake and eat it to. In the long run when your dog is finally fully mature and you become lax some the dog might start barking when someone is at the door. That fine, since now you can say, "Thank You for telling me someone is at the door, now be quite". The dog will be quite as it is your position to bark or protect. Obviously prevention is worth a pound of cure. If you work on making your dog be quite while it is a puppy, than keeping it quite as an adult is a piece of cake. Some times your quite puppy as they get older might suddenly start barking. As your puppy gets more mature they will test your authority. If you let the dog bark than you flunked the test. If you don't give the puppy proper structure and guidance the dog will take it upon themselves to be the leader and start their new job, barking. So how do we get them to stop? For puppies, first of all never let your puppy out of the kennel when they whine and bark. This is the start of them barking. When a puppy just starts barking often times just saying aaaghjt and clapping your hands will work. Once again, we need to find what behavioral interruptible approach will work based on your dogs temperament. If your dog hates water, try using a squirt bottle, if they love water than this won't work. Another approach is spray bitter apple in the dogs' mouth the second they bark. Unfortunately you have to be right next to the dog, not very practical. You might try using noise devices as your second option. A thrown shaking can along with aaaght works, if your dog is bothered by this. You can try some of the ultrasonic products on the market. These work well with a lot of dogs. If you have a bullet proof type of dog than you might need to invest in a citronella collar. You can also teach the dog to bark on command and than never give the command. We would only recommend a bark collar, if an owner has seriously tried and diligently worked with keeping our system, and it is either use a bark collar or the dog will be given away or put to sleep. However; so far none of our clients have ever had to use a bark collar. This article reflects the research from the best information found in Internet articles and from books, but does not reflect Vladae�s proprietary methods. 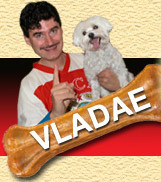 Please visit our dog training resource center to discover the Dog Wizard�s methods.